"Beautiful resort located close to the Tadoba National Park in the midst of the woods.Resort is well managed by Narayana and Saurabh. They value customer experience over anything else. This is attitude is reflected in how they attend to the guests and their concerns. Amazing experience "
" we would rate Tigers Heaven Resort in all factors of location, service, cleanliness and value..
Two best part of Tigers Heaven were 1) Location-very close to Navegaon gate. 2) Service-Entire staff right from the resort manager to the cooks and the helpers were super courteous & helpful..Keep it up !! We will definitely recommended to other travelers too..."
" Great hospitality excellent service, homely simple food & beautiful location. Good place to stay with family and friends,lovely people, place is like your second home. Great thing is, they have planted lots of trees to help Nature. Lots of birds and butterflies cab be seen inside the premises. We will love to come again and again to enjoy the nature apart from wildlife." " Wonderful hospitality & service. one more wonderful thing is property is attached to buffer zone, one can spot wildlife any time at resort. One more thing we have noticed that, they have water purifier plant, so you can get purified aro water for drinking as well for bathing !! great stay , great food & great sighting..wishing good luck with your future !!!! " " we enjoyed our stay at 'Tigers Heaven Resort'. The staff were very co-operative , courteous & helpful. Thank you for a pleasant stay..!!! " " Excellent Hospitality, lovely people- thanks you for making our day so enjoyable and for helping with 'NO CHILI' requests! lovely comfortable accommodation. we enjoy eating outside in the evening...soon we are going to visit again.."
" A brilliant stay at Tigers Heaven Resort with wonderful wildlife sighting in numerous numbers.Attentive pleasant staff and great food...."
" Overall great experience, staff is excellent (deepak/narayan) , Saurabh is extremely professional and always communicative, food was wholesome and chef was checking on any changes that were needed. soon, we will visit again "
"very good yummy Food.. Mr Dipak was very co-operative and helpful.rooms are very clean and well maintained. safari arrangement was very well managed and on time. great experience. highly recommended." "wonderful Hospitality, with awesome service with simple lovely food. Great sighting and great experience." " vary Hospitable staff, good service,testy food, 24 hrs hot/cold water supply for bathing, entire staff was very co-operative, keep it up!! " "Nice location big clean room, & testy food. Fabulous service !!! " 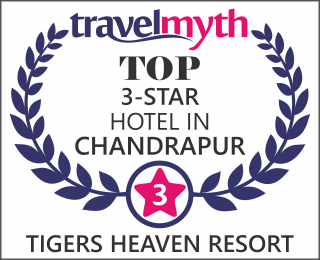 "Had a very nice stay at Tigers heaven Resort, truly 'Heaven' , food was excellent , staff is very cordial and co-oprative.overall very nice experience. Looking forward to coming again soon..."
"The place is just 5km away from the core area and attached to buffer zone so we can see wild animals at night from resort Its amazing!......we can find dears hanging around in the resort compound & the roadside. If you are lucky you could find bear crossing the road as well."